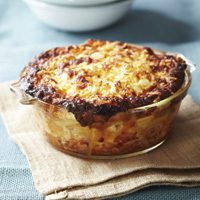 Make macaroni cheese more substantial with a layer of saucy mince – we’ve used pork instead of beef or lamb to save some more pennies. 1 Fry onion in oil for a few mins, to soften. Add the garlic and minced pork, and fry for 10 mins, to brown it all over. 2 Stir in the tomatoes, oregano and sun-dried tomato paste, and cook for a further 10 mins, until the meat is tender. 3 Heat oven to Gas180°C, Gas 4. Bring a large pan of salted water to the boil, add the macaroni and cook for about 10 mins until “al dente” — tender, yet still with a slight bite. 4 Beat the egg in a jug and mix with the yogurt. Season well. 5 Spoon the mince into the ovenproof dishes. Drain the macaroni and spoon it on top of the meat. Pour the yogurt mixture over, sprinkle with the Cheddar and feta. Bake for 25 mins until golden.